AMY to Investigate DOE Cash Awards Program. Read Reuters Article – “Exclusive: United States Sets Sights on China in New Electric Vehicle Push“. Watch Larry Reaugh Interview with Proactive Investors’ Steve Darling – “American Manganese Secures U.S. Patent for Lithium-Ion Battery Recycling Technology“. Read Bloomberg Article – “Battery Reality: There’s Nothing Better Than Lithium-Ion Coming Soon“. Read Waste Management World Article – “American Manganese Secures US Patent for Battery Recycling Technology“. 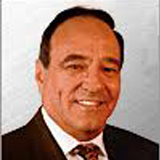 Read The Courier Herald Article – “The Inconvenient Truth About Batteries | Don Brunell“. 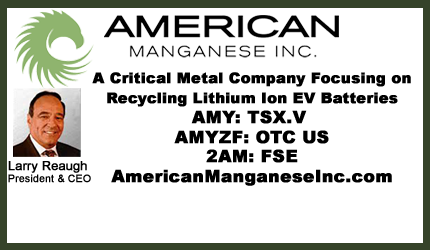 Read Mining.com Article – “American Manganese’s Lithium-ion Battery Recycling Technology Granted Patent“. Check out AMY’s Financing on Stockhouse DealRoom.